Smart Technologies for Sustainable Smallholder Agriculture: Upscaling in Developing Countries defines integrated climate smart agricultural technologies (ICSAT) as a suite of interconnected techniques and practices that enhance quantity and quality of agricultural products with minimum impact on the environment. These ICSAT are centered on three main pillars, increased production and income, adaptation and resilience to climate change, and minimizing GHG emissions. This book brings together technologies contributing to the three pillars, explains the context in which they can be scaled up, and identifies research and development gaps as areas requiring further investigation. It stresses the urgency in critically analyzing and recommending ICSAT and scaling out the efforts of both developing and disseminating these in an integrated manner. 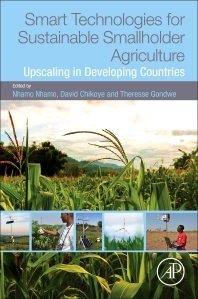 The book discusses, synthesizes, and offers alternative solutions to agriculture production systems and socio-economic development. It brings together biophysical and socioeconomic disciplines in evaluating suitable ICSAT in an effort to help reduce poverty and food insecurity. 8.1. What Is Integrated Agriculture Research for Development? 9.1. What Does Taking to Scale Mean? Dr. David Chikoye is the Director for the Regional Hub for southern Africa and the Plant Production and Heath Management thematic area. Dr Chikoye obtained his BSc from the University of Zambia, Zambia; MSc from the University of Manitoba, Canada; and a PhD from the University of Guelph, Canada. His professional background is research on weed management in the tropics. His main research interests include assessing the response of weed seedbanks to control options, promoting the use of cover crops for weed and fertility management, integrating the use of herbicides in smallholder farms, evaluating competition between improved crop varieties and weeds under different input levels, and promoting the uptake of improved weed, crop and natural resource management options by farmers. Other experiences include leadership of a large, multidisciplinary research project focusing on demand-driven, participatory research utilizing bottom-up livelihoods approaches. Dr Chikoye is a member of many professional organizations such as the Weed Science Society of America, American Society of Agronomy, African Crop Science Society, Nigeria Weed Science Society, and Southern Africa Weed Science Society. He has trained many postgraduate students and has contributed to authoring over 100 refereed journal articles and conference abstracts or proceedings. Prior to joining IITA, he was a postdoctoral fellow at the University of Guelph and lecturer at the University of Zambia. Therese Gondwe, a Malawian, is an active member of the information systems and humanitarian response technical working group. She worked with Feed the Children Inc. in Lilongwe, Malawi as the Program Manager prior to this appointment. She has a Bachelor’s degree in Agriculture from Bunda College of Agriculture, University of Malawi in 1995; a postgraduate Diploma in Management of Food Security and Nutrition Programs from the International Agriculture Centre, Wageningen, Netherlands in 1997, and an MSc Degree in Agriculture Extension from Reading University, Berkshire, UK in 2001. She completed her PhD in Human and Environmental Sciences at the same University in 2008. She has several years of experience in designing, implementing, and promoting adoption of integrated food security and nutrition project activities. Dr. Nhamo Nhamo - a Zimbabwean, is the SARD-SC Cassava Agronomist (Field Fellow) at IITA-Zambia. He was formerly an Agronomist (Consultant) at IRRI in Dar es Salaam, Tanzania. He worked as a Postdoctoral Fellow - Soil Fertility Agronomist at Africa Rice Center (2009-2011). Just before joining IITA, Dr Nhamo served as a Senior Lecturer at Chinhoyi University of Technology in Zimbabwe. He obtained a PhD in Agricultural Sciences from the University of Bonn, Germany (2007), Master in Soil Fertility (2003) and BSc Agriculture Honours in Soil Science from the University of Zimbabwe (1996).